To Dog With Love: Take Care of Your Dog's Chompers with New Dentastix Fresh from Pedigree! Take Care of Your Dog's Chompers with New Dentastix Fresh from Pedigree! Maintaining good oral health should be part of every doggie's routine, and Cosmo knows the importance of a nice smile and fresh breath too. 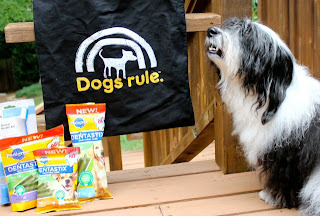 That's why he's super excited about new Dentastix Fresh Oral Care treats from Pedigree and today's giveaway -- a "Stay Clean and Fresh" gift pack! Read all the way down for how to enter. But first, some tips on good oral care from Pedigree. 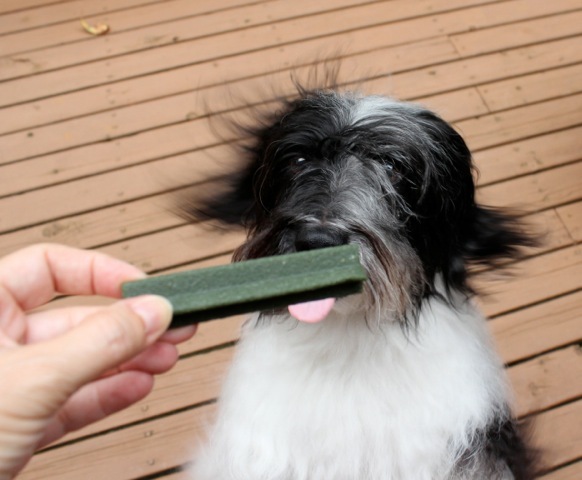 Daily brushing is the most effective way of keeping a dog's teeth clean. Be sure to use a toothbrush that's specially designed for dogs and never use toothpaste that was developed for humans. Use only doggie toothpaste. In addition to daily brushing, you can also feed your dog snacks that aid in oral care like PEDIGREE® DENTASTIX® treats for dogs. They're clinically proven to reduce tartar buildup by up to 80% when fed daily. Take your dog to the vet on a regular basis. This is imperative for your dog's oral health (and overall health too, I might add). Your vet will look for signs of gum disease, provide treatments, and recommend ways to help manage or prevent oral disease. I can smell the fresh! Now, both the original Dentastix and new Dentastix Fresh are available at grocery and mass merchandise stores nationwide. 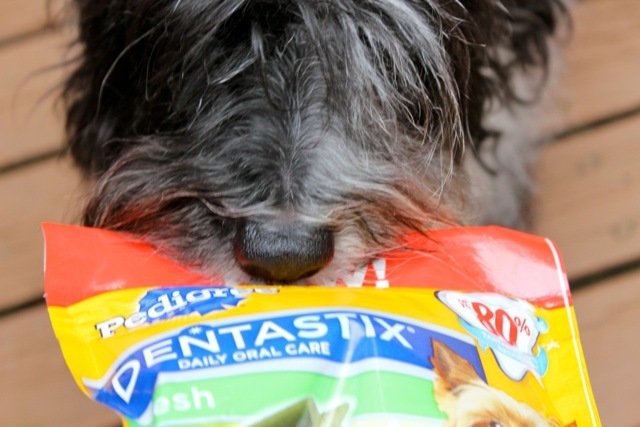 Dentastix Fresh is not only clinically proven to reduce tartar build up, just like the original DENTASTIX®, but it also helps freshen breath as DENTASTIX® Fresh Treats for Dogs contain a patented active ingredient combination. Win a "Stay Clean and Fresh" gift pack! Enter via our Rafflecopter giveaway below. Contest is open to U.S. residents until September 16 at 12:01 a.m.
mom brushes our teeth, ugh! Dumpling smiles when I say 'squeaky balls', because he loves playing fetch with them. Car rides, treats, and anytime my husband or I walk in the door. My dogs are happy guys. Go easy on those Dentastix buddy and leave some for me - I really think I need to try some of those - do they have the same great taste as the originals? good loven calls to my baby blue..
Havanese have a unique smile, and Bogie is no exception. He's a happy-go-lucky fellow, and his biggest smiles are when he's around his favorite people, or performing Obedience in the show ring. 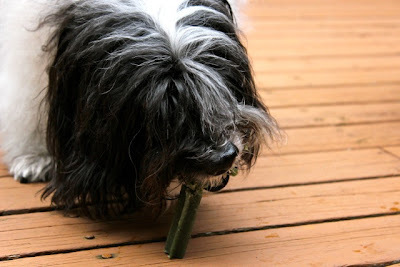 Havanese love to please. He'd really smile BIG with the Dentastix, Dogs Rule gear, and dental hygiene products! Bogie sez "hi" to Cosmo, his long time buddy! The dogs smile for ball, walks and chews.